As some of you may know, our very own Graeme Lambert took delivery of a Saab 9-5 TTiD Aero as a long term test back in April of this year. Graeme is a journalist for the British Car Weekly Auto Express. He has just sent us his latest artical about life with the stunning 9-5 Aero which can also be seen in full online. Life on the Auto Express road test team involves racking up untold distances every month behind the wheel of a varied selection of new cars. 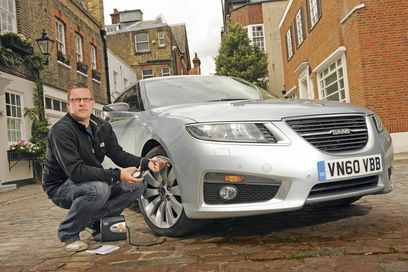 That has given me a sharp focus on fuel efficiency – and I’ve been conducting an experiment with our long-term Saab 9-5 to find out just what difference tyre pressures can make to your running costs in the real world. Our flagship Aero model looks great, with its sports bumpers, 19-inch Turbine alloys and lowered suspension. But it’s a bit of a sheep in wolf’s clothing, as the 2.0-litre twin-turbo diesel is surprisingly frugal for a car that measures five metres long and weighs nearly two tonnes. Initially, we averaged a decent 38.6mpg – and in our Cost Cutter special, we found that running the car with the tyres 10psi below the recommended pressure cut efficiency by 1mpg. But during the test, I noticed Saab quoted a separate Eco tyre setting next to the recommended figure – and I was keen to find out how this would affect my wallet. So for the past two months, I’ve run the rubber at these slightly higher Eco pressures – and the results are marked, with overall economy improving to 39.1mpg. This tells only half the story, though. Since our first report, the 9-5 has spent most of its time on short trips and in stop-start traffic on my commute into London. In this time alone, the average was 39.3mpg. In fact, on my last tankful, I achieved a 45.4mpg fill-to-fill average – less than 1mpg short of Saab’s official claimed combined figure. This is superb considering the car has barely been able to stretch its legs; nose-to-tail town driving is usually an antidote to strong fuel returns. Not that it’s likely to last. I’ve started to make use of the 9-5’s removable towbar to take my track day car to different venues on its trailer, and the overall figure is sure to tumble again. Unusually, the on-board trip computer in the Saab is rather pessimistic about its efficiency, under-reading by more than 3mpg for the time we’ve had the car. It hasn’t all been about economy, of course – the saloon is one of the best multi-taskers on our fleet. As we’ve reported in the past, it’s been used as a wedding car, enjoyed a few laps at Wiltshire’s Castle Combe circuit at a summer track day and even been displayed at a classic car show as part of a Saab club stand. It never fails to exceed my expectations. That’s not to say it’s perfect, though. The light interior has started to discolour with dirt, and the leather on the driver’s seatbase has become baggy. Plus, even though the 2.0-litre TTiD blends pace and efficiency well, there’s no getting away from its gruffness, especially when cold. Still, at the end of a long day, I’m always happy to jump back in the Saab and head home. And the near-40mpg economy means I rarely have to make a filling station stop along the way. A big thank you to Graeme for his latest words.